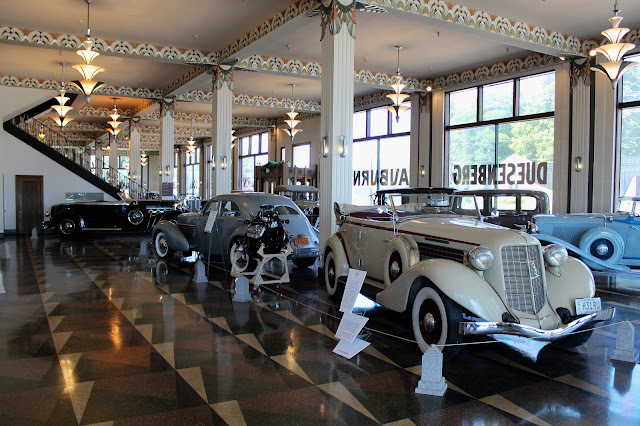 Driving 2 1/2 hours north along I-70 and I-69 brought us to the Indiana town of Auburn (population 13,052) and what surely must be considered one of the highlights of an motoring enthusiast's trip: the Auburn Cord Duesenberg Automobile Museum. 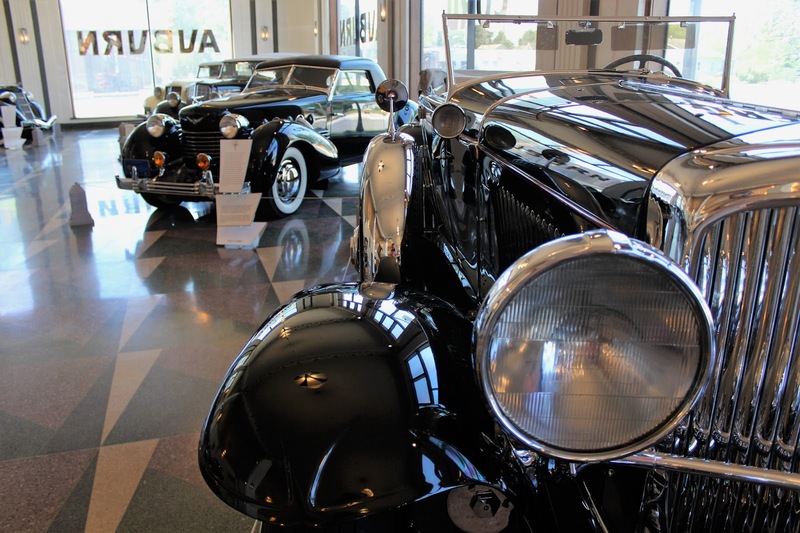 A-C-D is rightly considered one of the greatest companies in automobile history although it only lasted for 37 years. 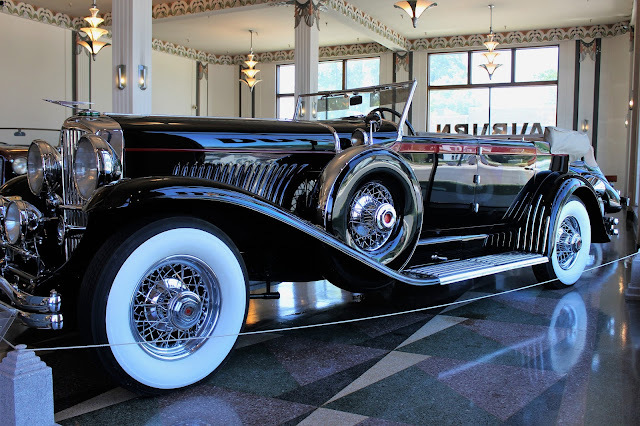 But in that time it produced some of the most stylish and technically-advanced cars anywhere, from the monstrous and spectacular Duesenberg straight-eights to the coffin-nosed Cord 810/812 series. The museum, which is divided into seven galleries and generally shows around 125 cars, is located in a truly magnificent Art Deco structure, which was the company's actual administrative building and showroom. It was designed by architect Alvin Strauss and constructed in 1930. 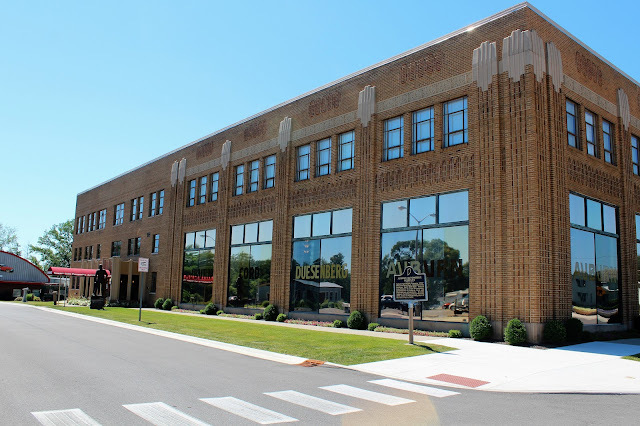 After the company's demise, the building saw varied uses, first serving as a warehouse and repair shop for old A-C-D cars until 1960, then as storage for a clothing company, then to a motorcycle shop. Damaged by fire in 1973, it was purchased by local citizens a year later and opened as a museum in August 1974. 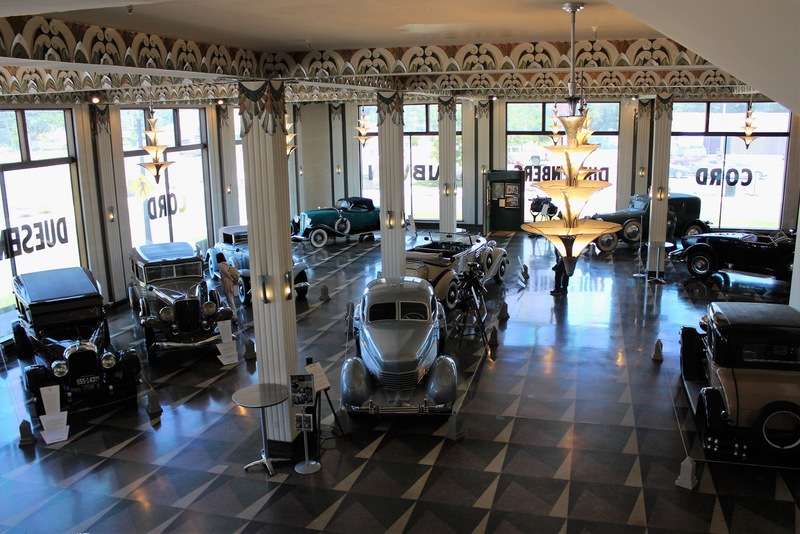 In 2005 the entire museum facility was designated as a National Historic Landmark. 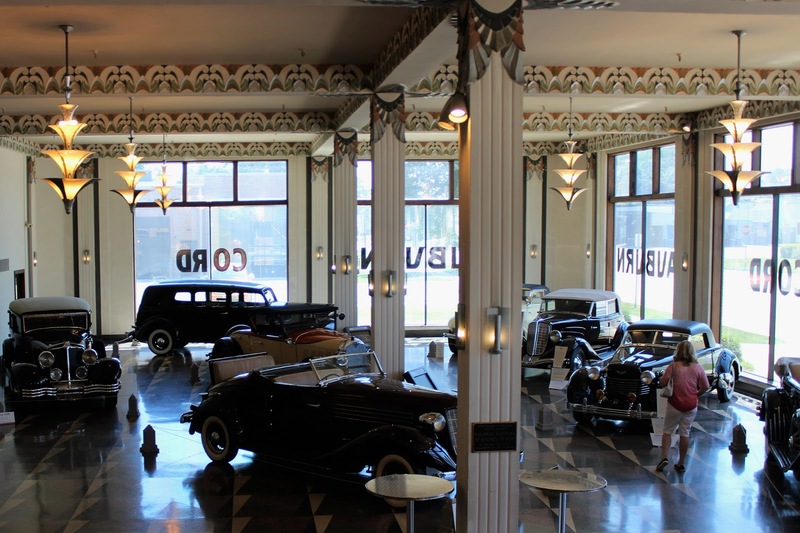 Indiana has a long history related to car production, with notable companies including Stutz, Marmon, and Studebaker. 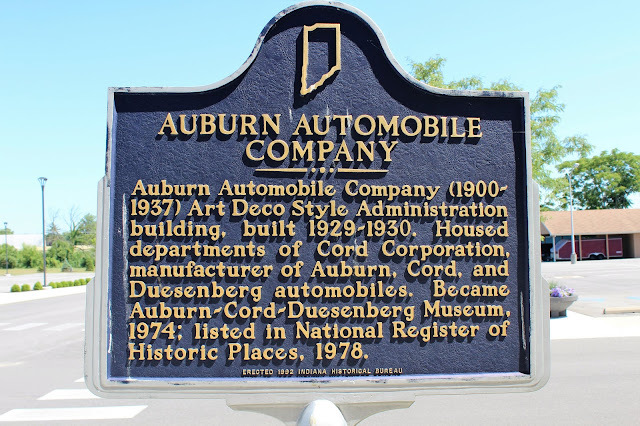 The Auburn Automobile Company was founded in 1900, having grown out of a local carriage company that was itself established in 1874. This early phase of the industry saw an amazing number of firms come and go and Auburn was only moderately successful. The original founders sold out in 1919 but the new owners' timing was not very good as a sharp deflationary recession took place in 1920-1921 in the United States and car sales crumbled. Desperate to keep things afloat, in 1924 the owners brought in 30 year old Errett Lobban Cord to save the company. 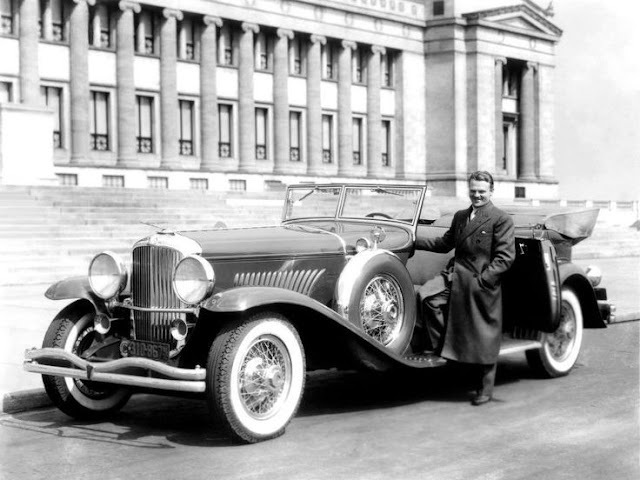 A former race car driver and mechanic, he had become a star salesman at a dealership in Chicago selling cars from the St. Louis-based Moon Motor Car Company. He took on the job with the proviso that if he was successful he could buy control of the company. E.L. Cord was a brilliant businessman. Taking the unsold Auburn cars, he had them refinished in flashy new paint schemes and rapidly sold them, then taking control of the Auburn company by the end of 1925. He went on a buying spree and incorporated his holding company, the Cord Corporation in 1929, to hold controlling shares in around 150 different companies, mainly focused on the transportation industry. 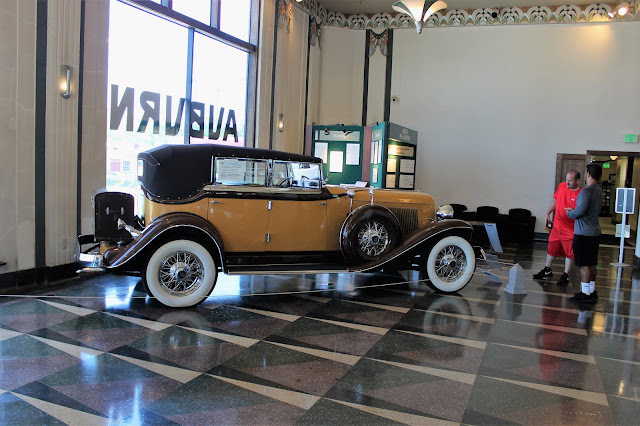 Besides the Auburn Automobile Company, they included Stinson Aircraft, Lycoming Engines, American Airways (later American Airlines), Duesenberg Inc., New York Shipbuilding, and Checker Cabs. Realizing that he could not compete with the volume manufacturers of the day--General Motors, Ford and Chrysler--Cord took a different route, making Auburn cars, technically mid-range at best, into style leaders of the era, beautiful cars that belied their moderate price. By 1928, Auburn had become the 13th largest seller of cars in the United States. 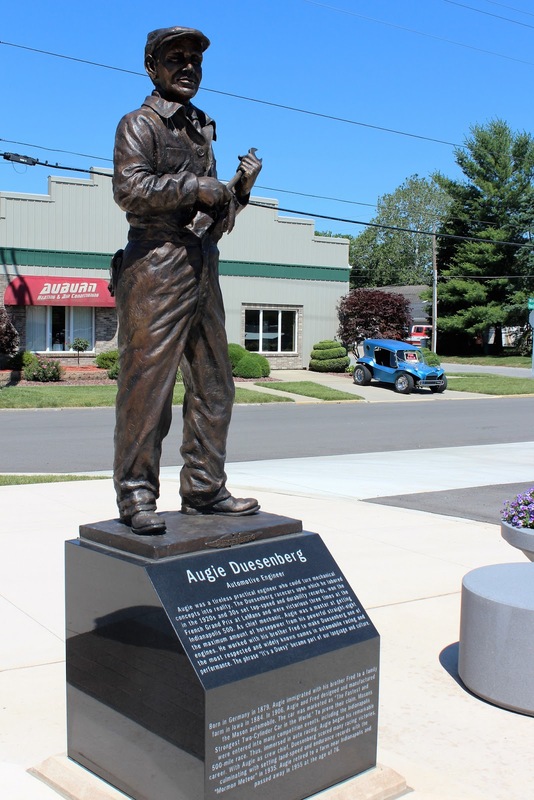 Founded in Minnesota by the Duesenberg Brothers, Fred and Augie, in 1913, and moved to New Jersey in 1916 and then to Indianapolis in 1919, the Duesenberg Automobile and Motors Co. Inc. had a reputation for advanced engineering. In 1923 a Duesenberg race car driven by Jimmy Murphy won the French Grand Prix but the success of the company's experimental and racing cars did not translate into consumer sales and by 1924 the firm was in receivership, stumbling onward somehow until 1926, when E.L. Cord added the company to his collection in order to acquire the brothers' technical expertise and the brand name. He challenged Fred Duesenberg, now Vice-President of Engineering and Experimental Work of the restructured and renamed Duesenberg, Inc., to built the fastest, most powerful and most expensive luxury car in the world. 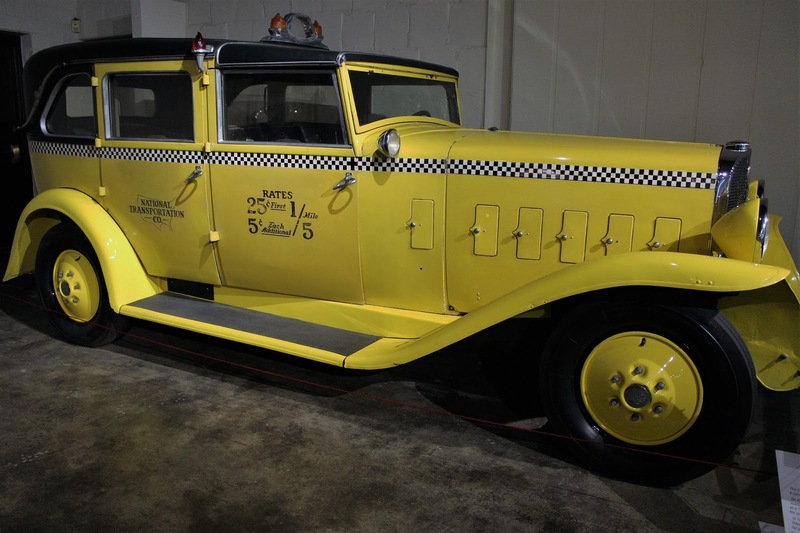 The Model J premiered at the New York Auto Show in December 1928. 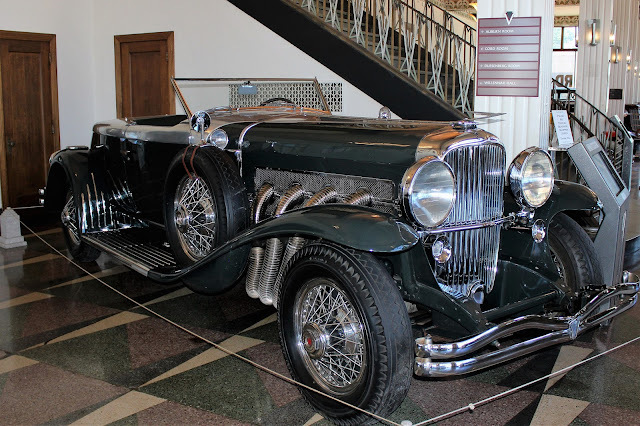 Sold only as a chassis and motor, the J (and its supercharged variants, the SJ and SSJ), was chosen for some of the most extravagant and beautiful (and expensive) custom bodies of the era. The straight-eight engine, based on earlier Duesenberg racing engines, produced 265 hp and used dual overhead camshafts and four valves per cylinder, decades ahead of its time. 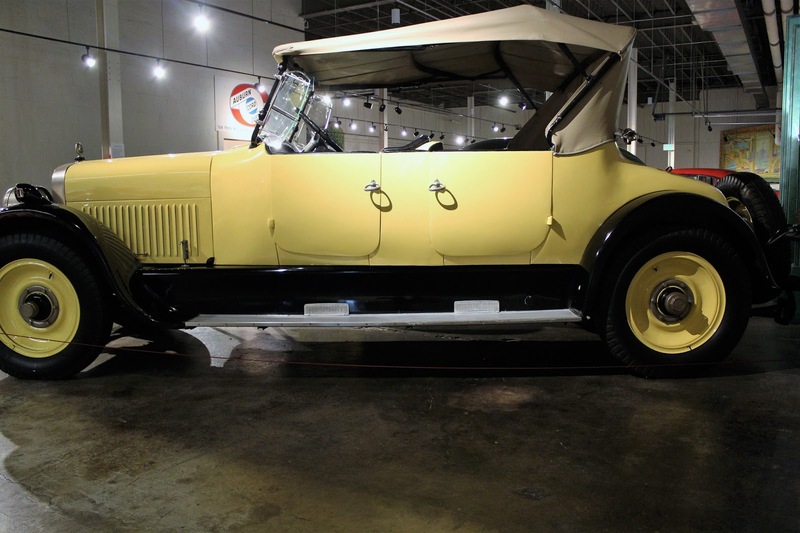 The Model J was capable of 120 mph and completed cars ranged up to $25,000 in price at a time when a nice Model A Ford cost around $450. 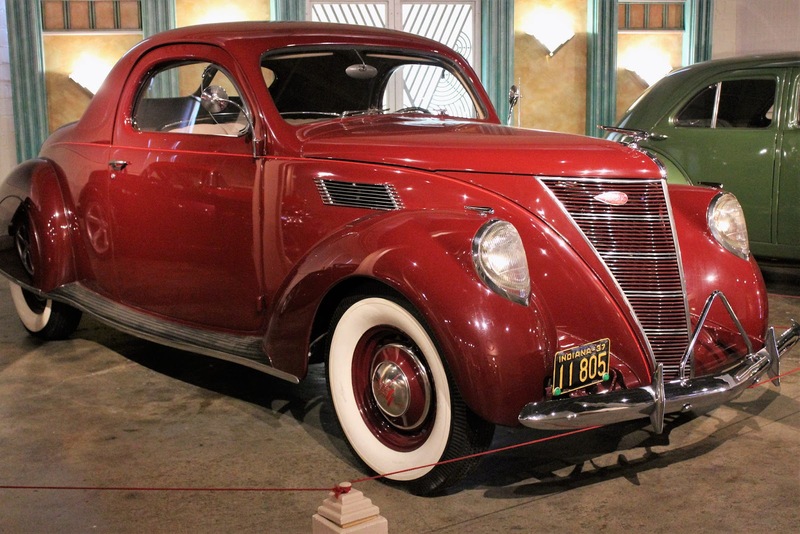 Plans to build 500 cars annually were wrecked by the Great Depression and when production ended in 1937 only 481 cars had been built but it is thought that around 378 still survive. 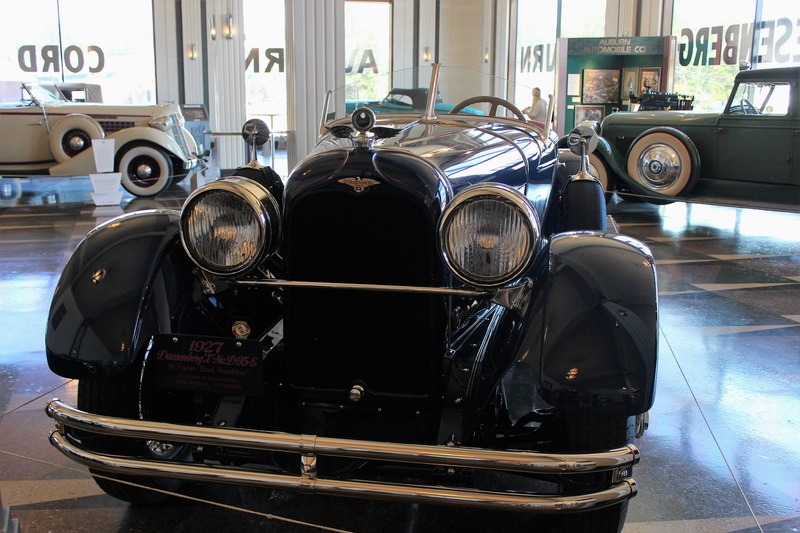 In 1929, a new brand was established at Auburn, with the birth of the Cord L-29, the first American front-wheel car to be offered. Gorgeous and low-slung, the Cord was heavy and underpowered but considered to have excellent handling. Only 4,400 were built before the Depression ended production in 1932. 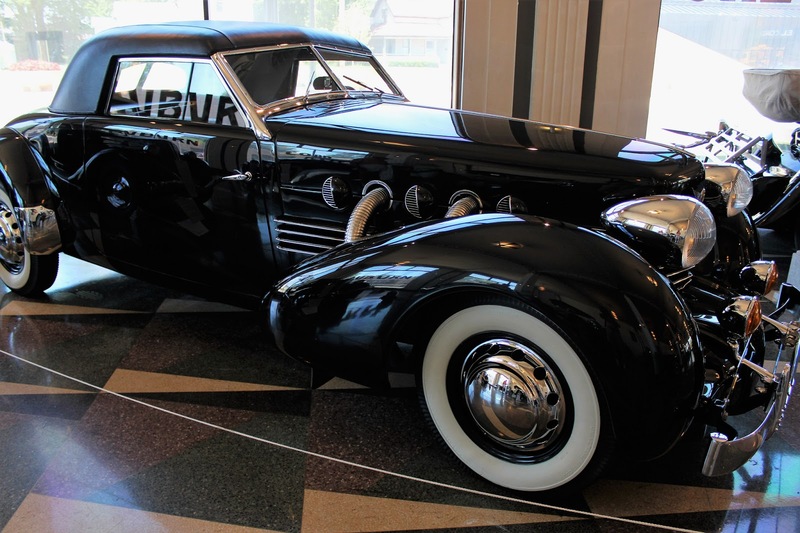 It was eventually succeeded in 1935 by the revolutionary Cord 810, designed by Gordon Buehrig, and originally conceived as a "Baby Duesenberg," but with the era of conspicuous consumption ending in the dark days of the Depression, it was decided to name it as a Cord. With front-wheel drive, retractable headlights and unique Art Deco styling, the "coffin-nosed" Cord was a sensation but it was too little, too late as the Cord empire collapsed. 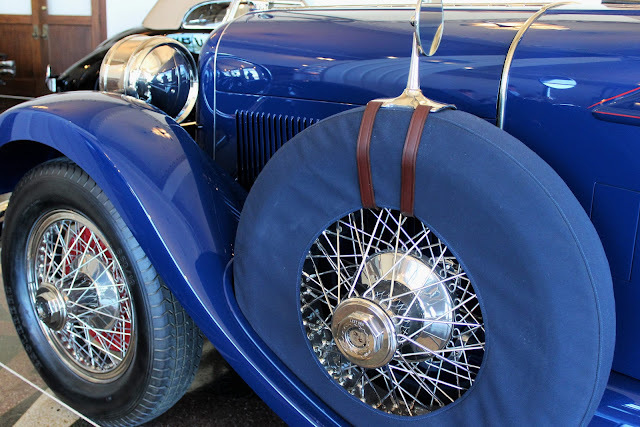 Styling and engineering were not enough to save the company in spite of the Cord 810 or the impressive (and bargain-priced) Auburn V-12, housed most famously in Buehrig's boat-tailed Speedster body. E.L. Cord, who had a run-in with the Securities Exchange Commission regarding dealings with Checker Cab stock, sold out his Cord Corporation holdings in 1937. 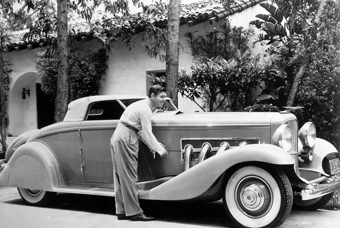 He went on to make more millions in California real estate (the Cord 810/812 Beverly Sedan was supposedly named after his Beverly Hills holdings! ), as well as radio and early television stations. He made yet more money in Nevada, where he also became a State Senator, ultimately passing away in 1974, aged 79. 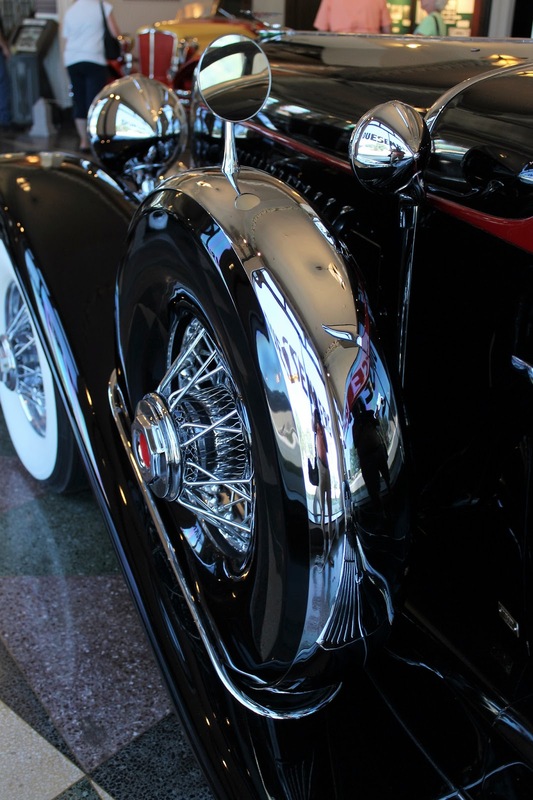 The US automobile industry produced a number of remarkable characters but many are now essentially forgotten. 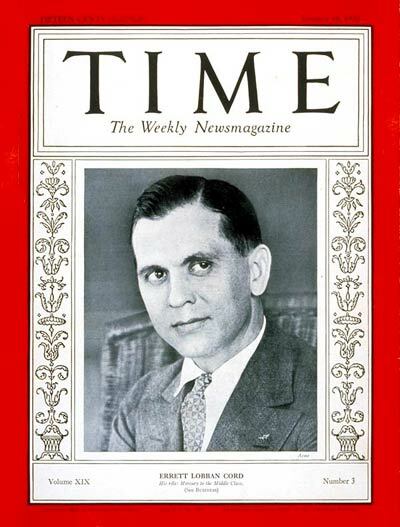 Compared to the studies devoted to Henry Ford, there are only a handful of books about the founder of General Motors, Billy Durant, a single one (an incredibly expensive and rare coffee-table book) about E.L. Cord, and nothing much about John North Willys, another remarkable pioneer. But now back to the museum! Passing the nicely-stocked gift shop at the entrance, the visitor comes into the street-level floor of the museum and it is suddenly 1930 again. This is the authentic high-ceilinged Auburn showroom and is spectacular with its marble floor, pillars with sconces, huge windows, and fine trim paintwork. 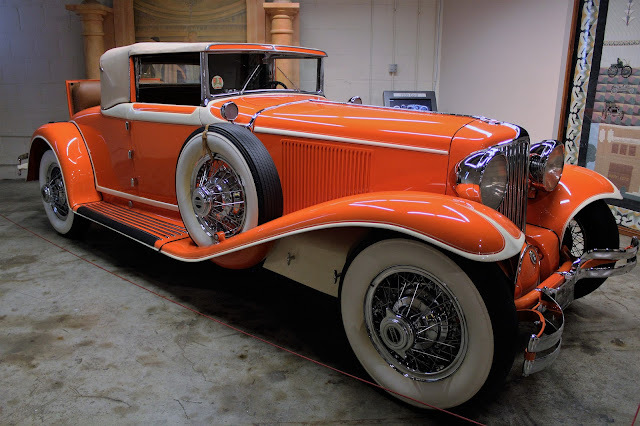 It is once again serving is original purpose of showing off the cars of the Auburn, Cord and Duesenberg brands. Although the museum does own a number of cars, many are also on loan from A-C-D enthusiasts. Here follows a selection of photos of cars that were present during our visit in June 2016. We subsequently saw at least a few of them at other locations during concours events so they do move around. 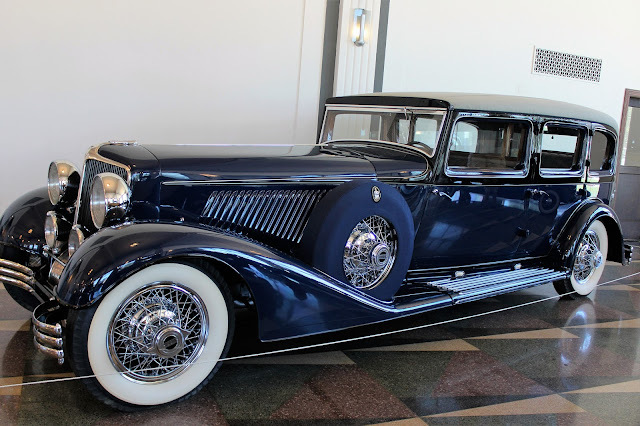 The first car we saw was this magnificent 1930 Cord L-29. The current owner bought it in 2005 and is only the third owner as the car was in storage for over 60 years. It was restored to its original colour scheme of black and copper. 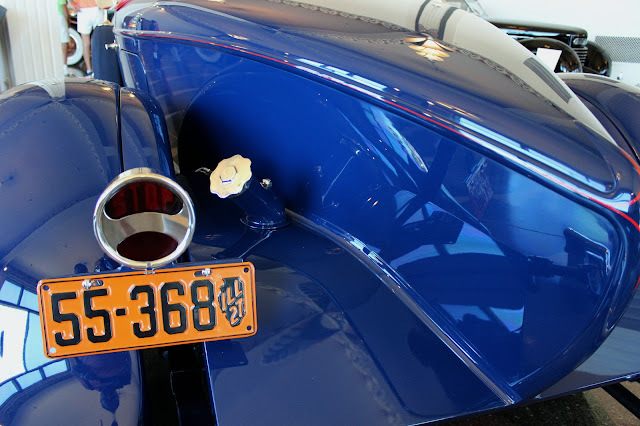 The car was styled by Al Leamy, a brilliant designer responsible for much of the Auburn and Cord bodywork between 1928 and 1934. 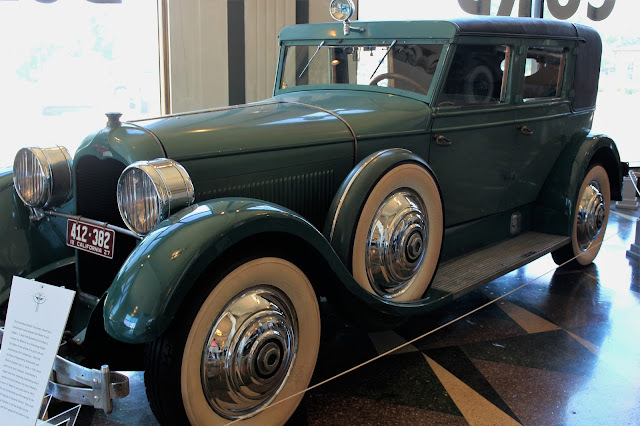 Blamed for the poorly-received 1934 restyled Auburn, the self-taught Leamy went on to General Motors, where he tragically died from blood poisoning connected to a company diptheria vaccination in 1935. He was 33 years old. Gordon Buehrig, who was doing designs for Duesenberg bodies, was brought over to redo the Auburns for 1935 but it probably would not have mattered given the economic conditions of the day. Introduced at the New York Salon in January 1931 to encourage sales, the single L-29 Boattail Speedster show car went on to shows in Toronto and Paris, as well as Cord dealerships in North America, before eventually disappearing. 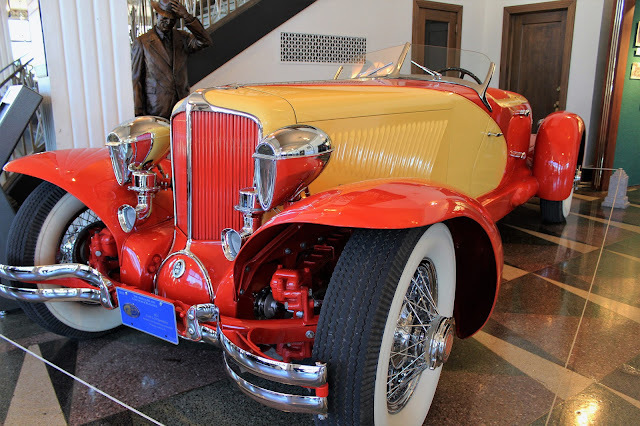 This is one of two replicas of the car, built with authentic Cord running gear, the other being at the Stahls Auto Museum in Michigan. 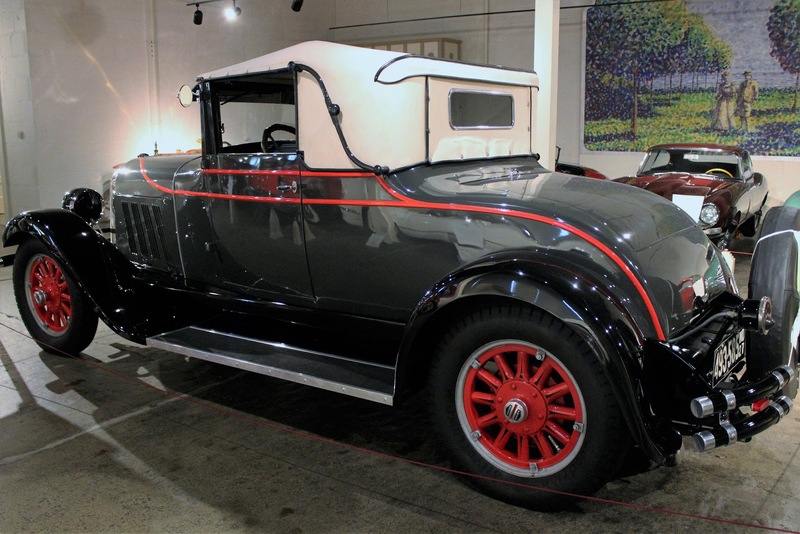 In a building filled with rarities, one that must rank among the rarest is the 1927 Duesenberg Model X, donated to the museum in 2015. 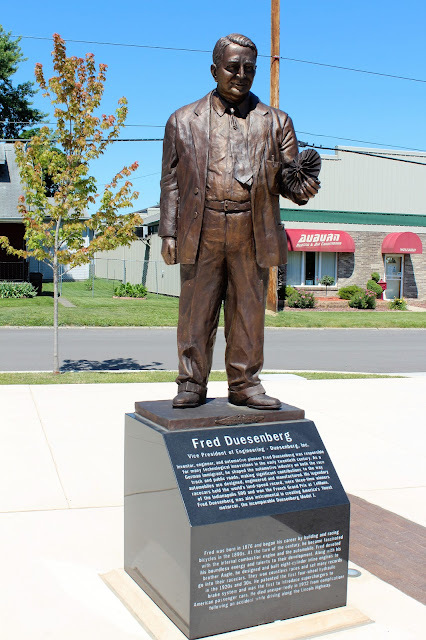 In attempt to attract interest to their floundering company in Indianapolis, the Duesenberg Brothers launched a new model to replace the ageing Model A and thirteen Model X chassis were constructed and a revised engine developed. One chassis was sent to McFarlan, a coachbuilder in Connorsville, Indiana, for an aluminum "boat-tailed" roadster body, with the idea of sending the completed car to the New York Auto Salon. 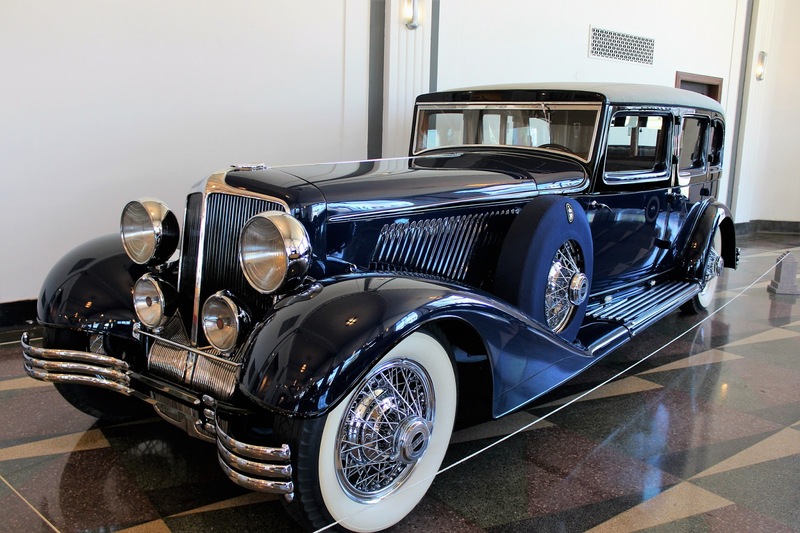 However, in Fall 1926 E.L. Cord bought Duesenberg and development of the Model J began. The Model X Roadster did go to New York for the show and four other Model Xs in other body styles were built, but the remaining eight chassis were destroyed or used in Model J development. 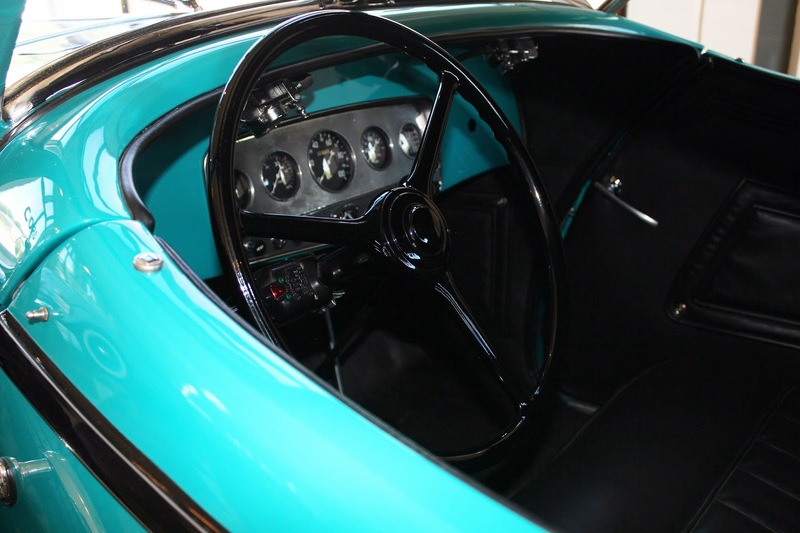 In 1996 a massive restoration project of this car began, taking some 4,000 man hours to bring it back as closely as possible to its original condition. The body style was to be very influential, and was picked up in the famous Auburn Speedster subsequently. 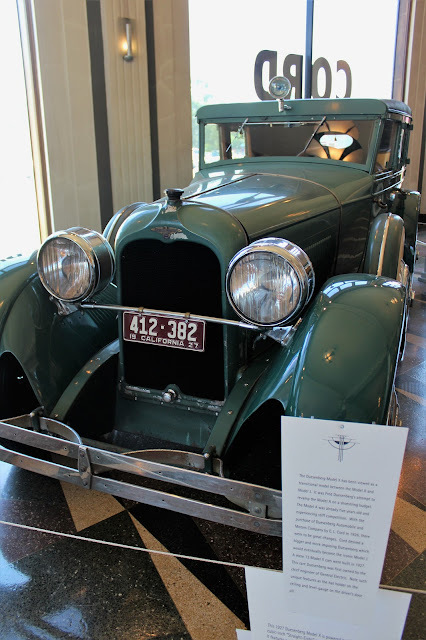 The museum also displays another Model X, a green sedan once owned by the chief engineer of General Electric. 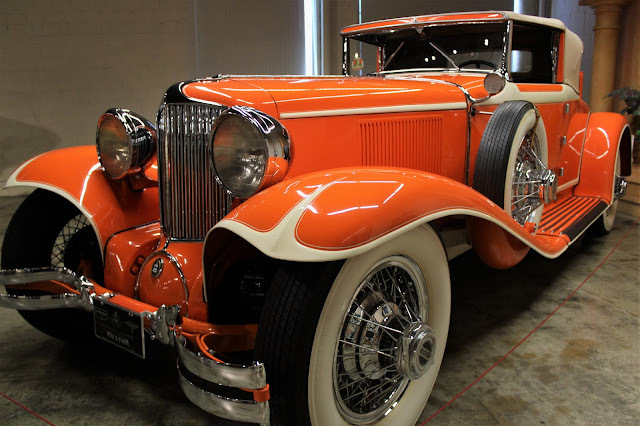 Another sedan is owned by comedian and Duesenberg enthusiast Jay Leno, while a Model X Roadster still exists as well, so most of the five original cars are accounted for. 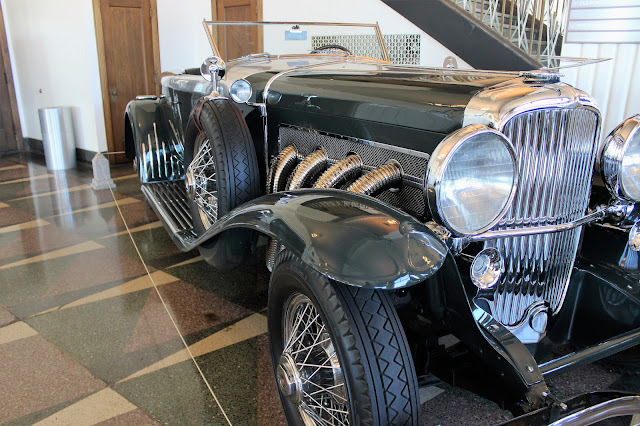 The most expensive car in the 1933 Auburn line-up, this V-12 car sold for $1,848 and was one of only 68 produced that year. 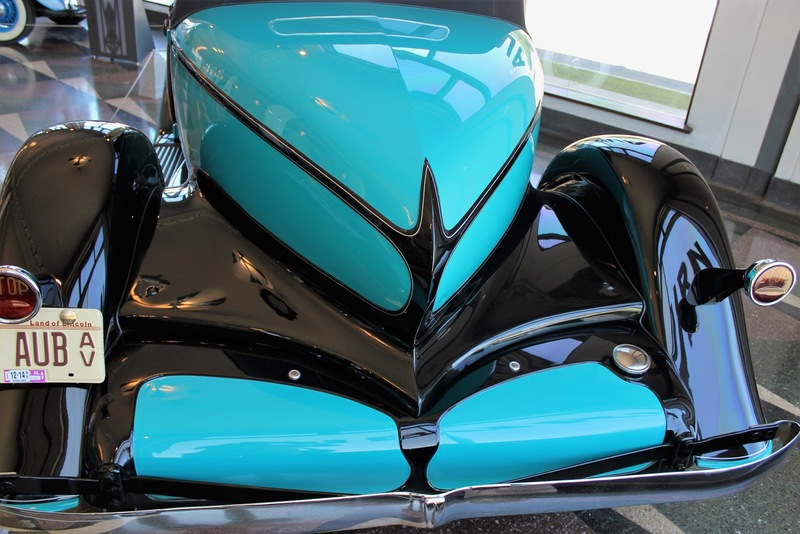 It was purchased in 1968 by an enthusiast from Jamestown, New York, who spent two decades restoring it to perfection. 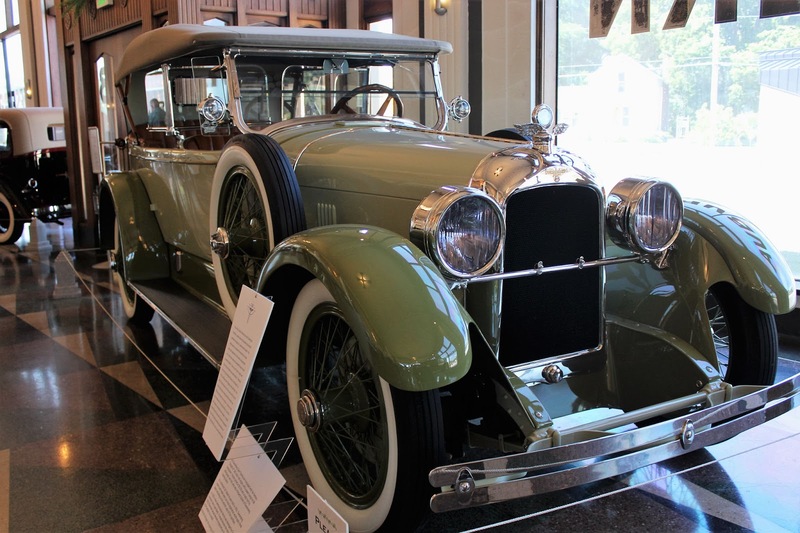 J. P. Getty, the oilman who was once the wealthiest man in the world, purchased this car from Cliff Durant, son of General Motors founder Billy Durant, who only owned it a few months, and drove it until 1940. 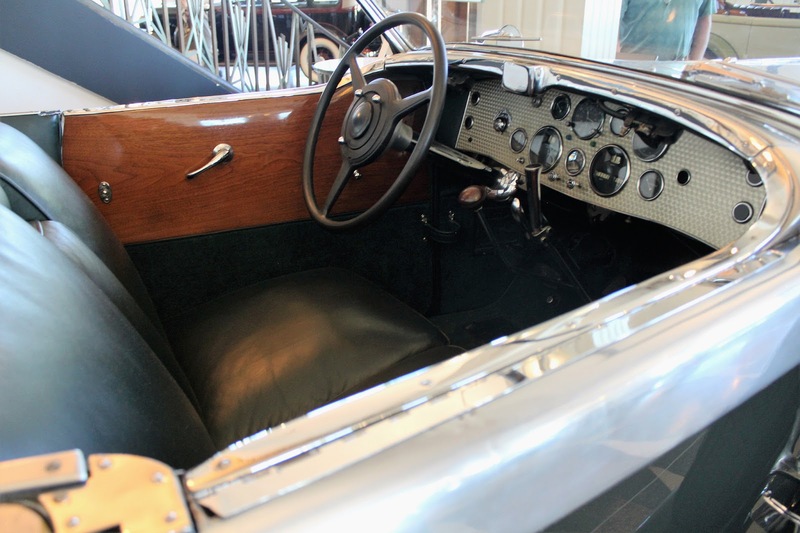 One of five built in this style by Murphy, noted coachbuilders in Pasadena, California, the car cost $14,000 new. It was also owned at one point by author John O'Hara. Its last owner, who donated it to the museum, owned it for four decades and drove it for 105,000 miles. 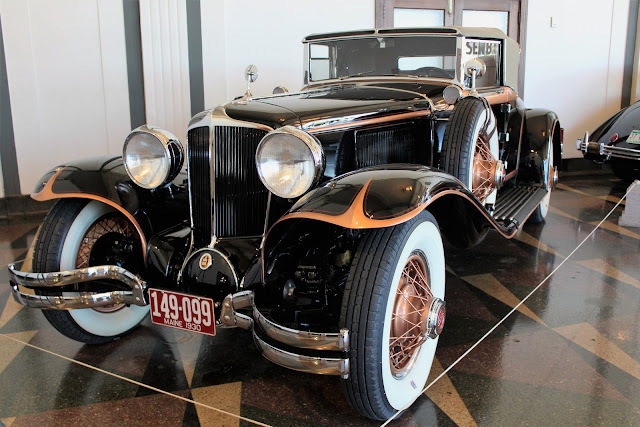 One of only three hardtop Cord 812 Coupes built, this car was a special order for the President of the Champion Sparkplug Company, and has a number of unusual features. 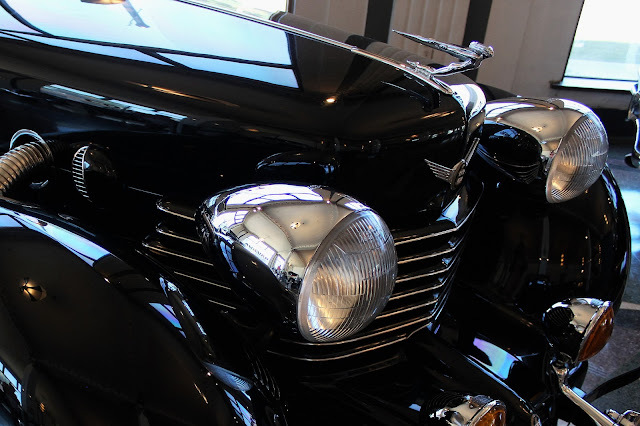 Most striking are the fixed Auburn headlights rather than the usual (and novel) retractable ones. The car was first driven in Ohio, then went on to California and was discovered in neglected and very decrepit condition in Montreal before undergoing a multi-year restoration and, ultimately, donation to the museum. 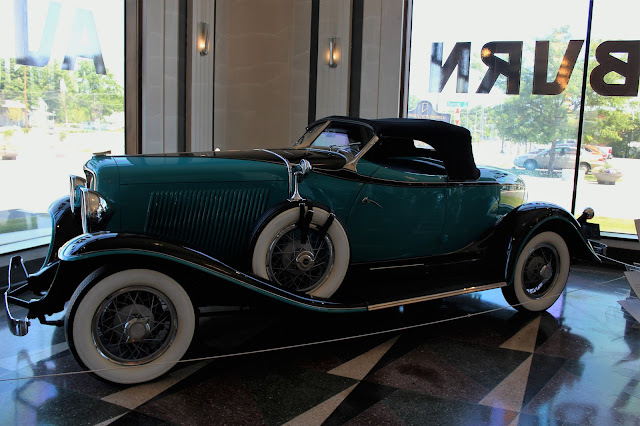 Certainly one of the rarest cars on display is the amazing Cord E-1. E.L. Cord did not want the challenge posed by the V-16s of Cadillac and Marmon to go unopposed so in 1932 a V-16 Cord came to be. 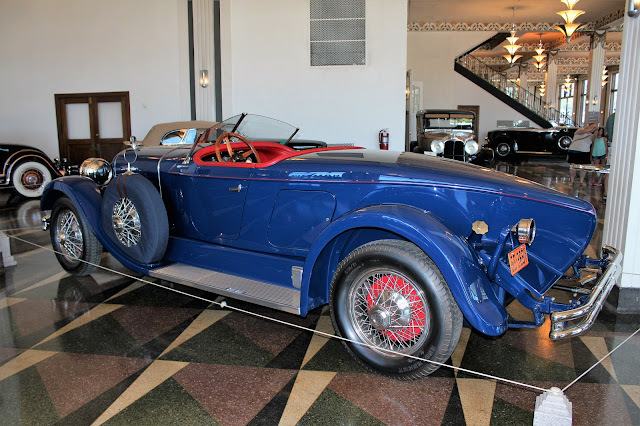 As Cord practice was to locate the engine behind the front axle for a long cowl to bumper proportion, with an engine this big the car ended up with a truly mammoth 157 inch long wheelbase and it weighed three tons. 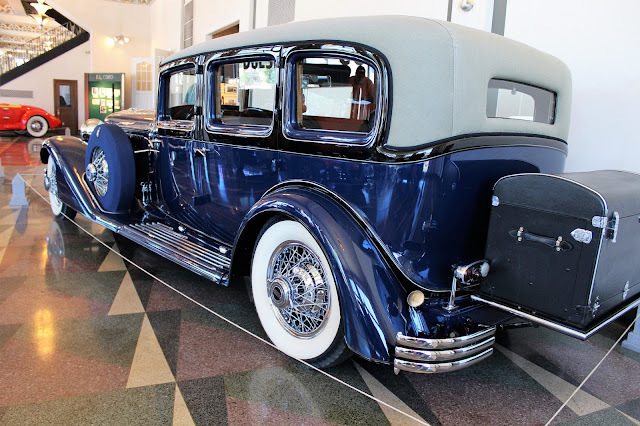 Used by Cord as a personal vehicle for a while, the seven passenger limousine had its engine changed to an Auburn V-12 but it was soon decided that the Great Depression was no time to launch something as ostentatious as this car. The engine was removed and used to run a generator at the factory. Eventually, the remains of the car, minus engine, fenders and grille, was found in a barn in Illinois in 1977. 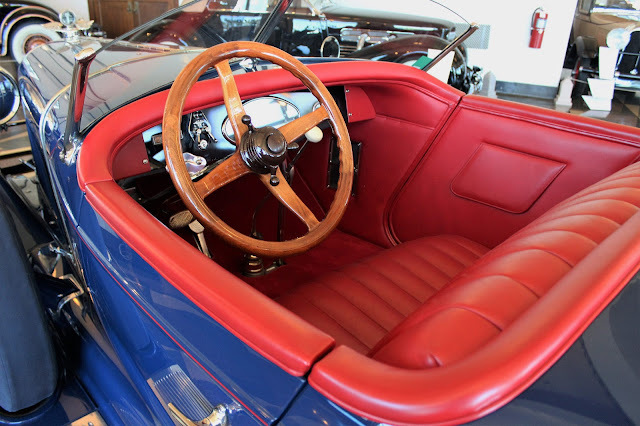 Over the following decades, original bits and pieces were located and the car lovingly restored by the time the 2003 Pebble Beach Concours rolled around. It was shown there and soon after donated to the museum by its restorer, a retired physics professor. In an effort to expand its sales, Auburn began to offer commercial vehicles in 1936, notably a limousine, an ambulance and this hearse, or funeral coach. 36 inches longer than a standard Auburn 852, this car sold for $1,895 and weighed 4,300 lbs. It would have been one of the final Auburns built in Auburn itself as production shifted to another plant in Connersville, Indiana. 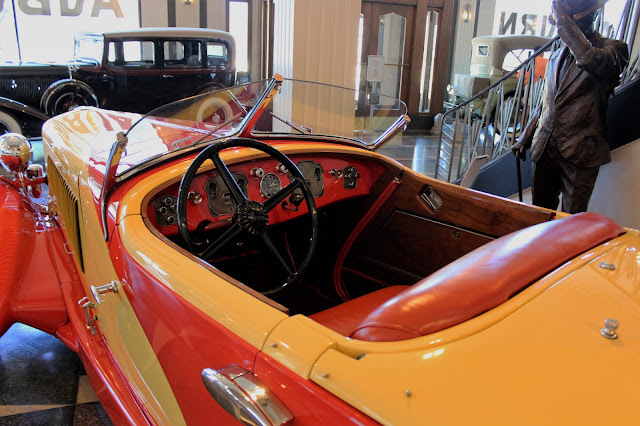 Moving out of the "Company Showroom" gallery, we found ourselves in a smaller, side gallery devoted to "Special Interest Cars" from manufacturers other than A-C-D. This area was originally the Experimental Wing, Engineering and Design of the Auburn Automobile Company. Considered one of the most beautiful cars of all time, and heavily influencing sports car design subsequently, the Cisitalia was built in Italy in both coupe and convertible versions and powered by a FIAT 1100 cc engine. 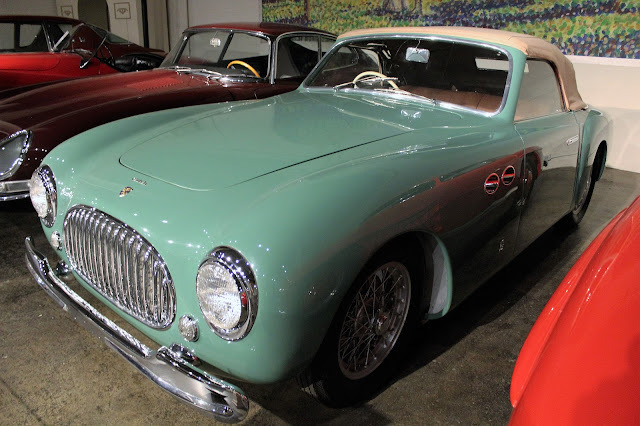 The body was designed by Pinin Farina and modified by Vignale, with 153 coupes being constructed but only 17 of these extremely rare convertibles before production ceased in 1952. 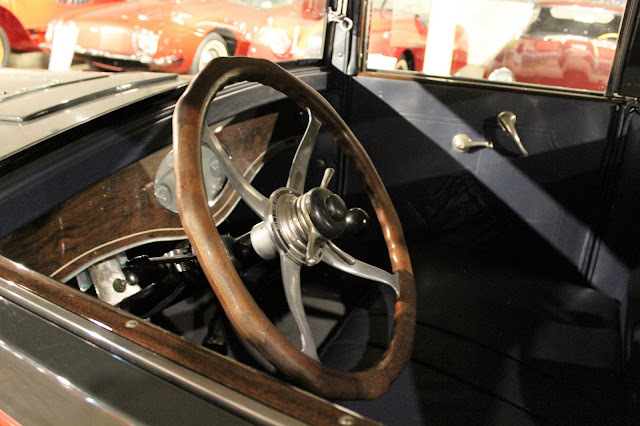 The Graham Hollywood is particularly significant to connecting the dots of the Auburn Automobile Company’s automotive history and the evolution of automobile design. 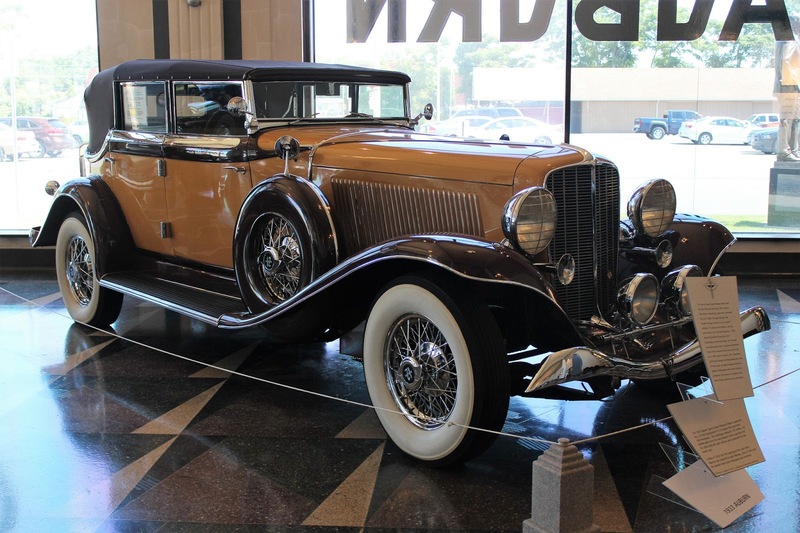 The Auburn Automobile Company manufactured Cord automobiles and the Graham Hollywood is a direct descendant of the notable Cord 810/812 design. 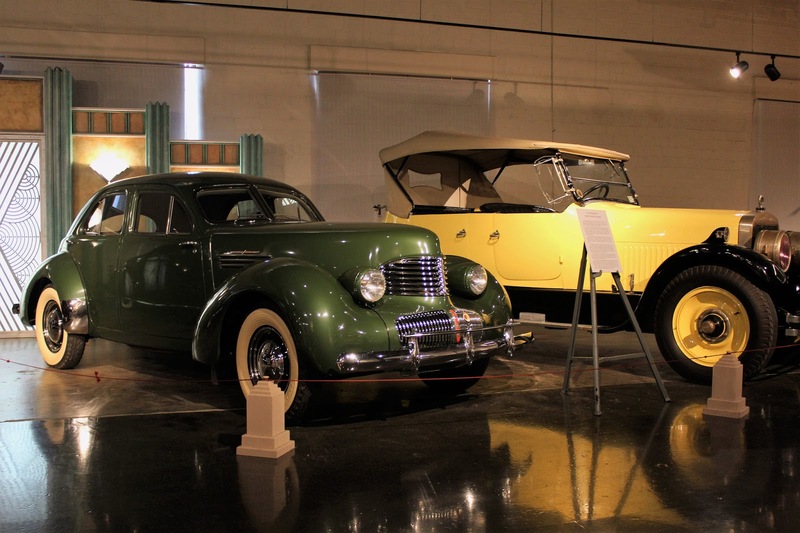 In 1937, when the Auburn Automobile Company went out of business, another automobile manufacturer, Hupmobile of Detroit purchased the dies, jigs and tools used to manufacture the front-drive 810/812 Cord and converted them for use in a rear-drive Hupmobile. 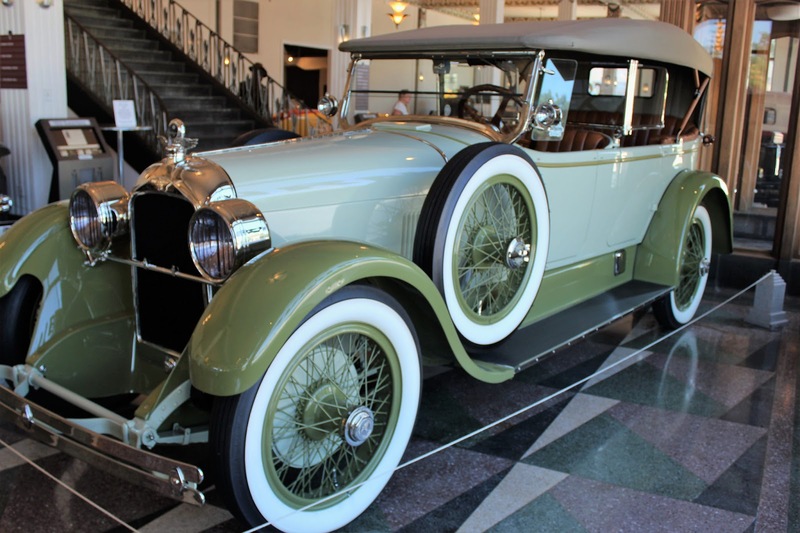 Struggling financially, Hupmobile soon granted the right to use the Cord dies to Graham of Dearborn, Michigan, for a similar car of its own, the Graham Hollywood. Originally a producer of carriages and sleighs, James Cunningham, Son & Company began producing cars in Rochester, New York, in 1908. It was noted for its very high quality products, considered the equal of anything produced in Europe, and priced to match. 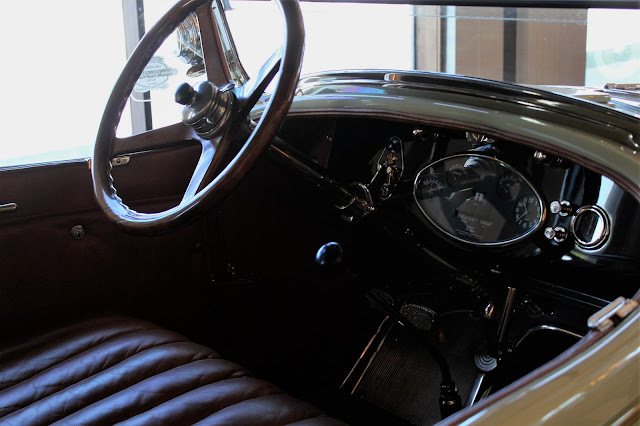 It was an early proponent of the V-8 engine, introduced into its cars in 1916, and was the choice of numerous celebrity owners but production numbers were always low. The company stopped producing cars in 1931 but continued to build bodies for other manufacturers until it shut down in 1936. 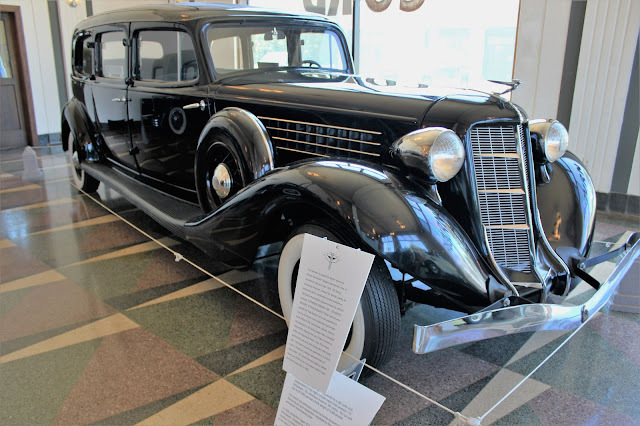 Introduced in 1935 as a 1936 model to be a lower-priced alternative to more traditional Lincolns, the Zephyr used a small V-12 derived from the Ford flathead V-8. It might be considered as the first successful streamlined car and was produced until 1948, probably keeping the Lincoln brand alive. 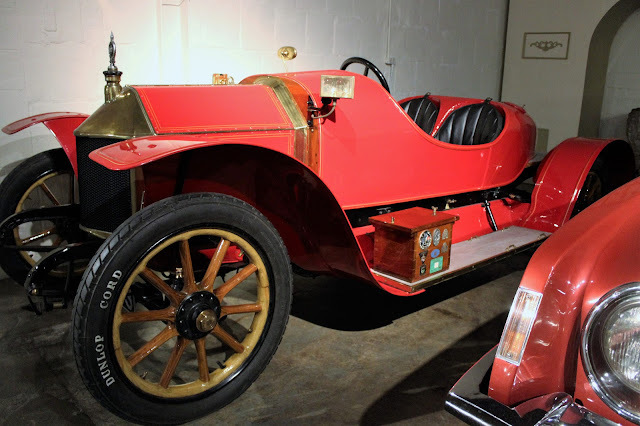 The Metallurgique was considered the premier sports car of Belgium and this 1911 roadster, with body by Vanden Plas, is one of the earliest cars featuring a boat tail. 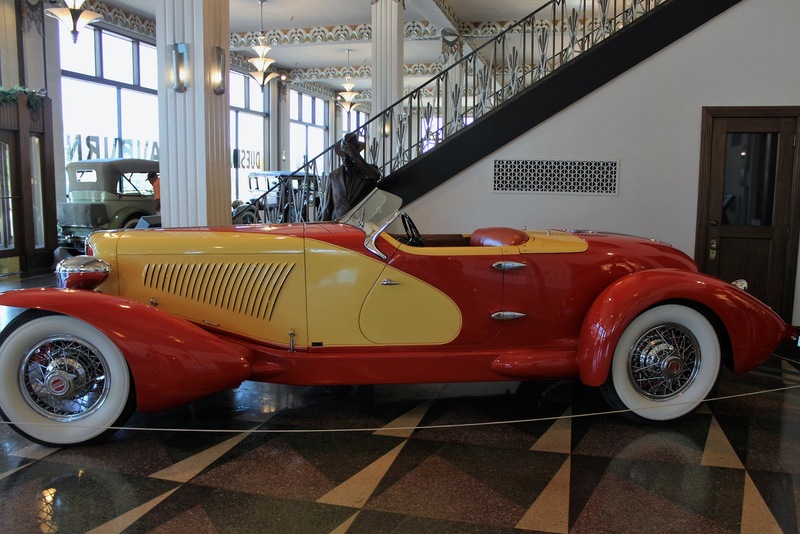 This car was featured in the 1965 movie "The Great Race." The chief engineer of Metallurgique, Paul Bastien, left Belgium for the United States in 1923 and joined Stutz in Indianapolis as assistant chief engineer. He was responsible for the famous Vertical Eight. Metallurgique ceased production in 1927, having been taken over by another manufacturer, Imperia, and the factory went to yet another Belgian car marque, Minerva. 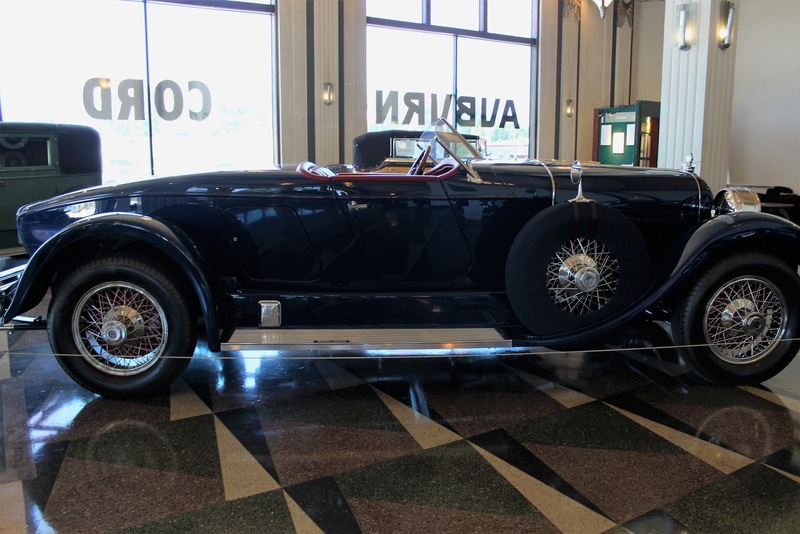 And of course this blog devoted to Corvettes cannot end the first part of this visit to the Auburn Cord Duesenberg Automobile Museum without a Corvette. Here we have a great pair of photos as I have always wanted to get a nice picture of the Corvette with its rival, the Ford Thunderbird. 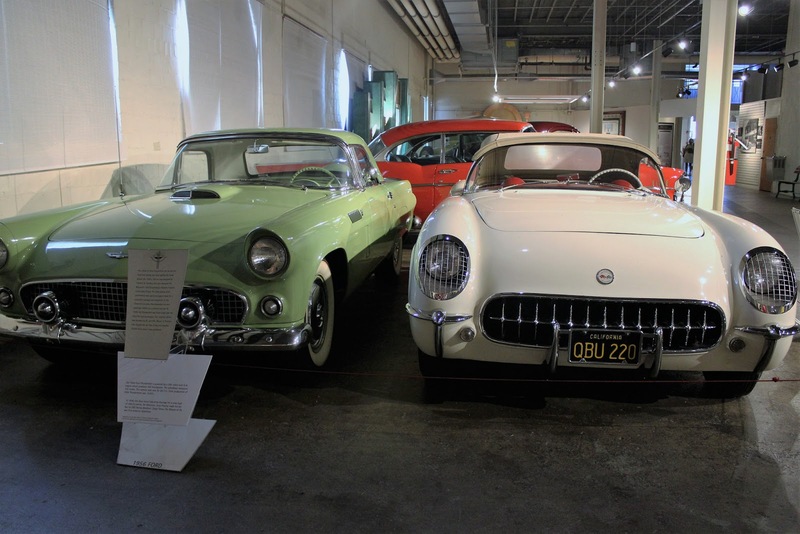 The museum has a 1956 T-Bird, build in the second year of production, along side of a 1954 Corvette. 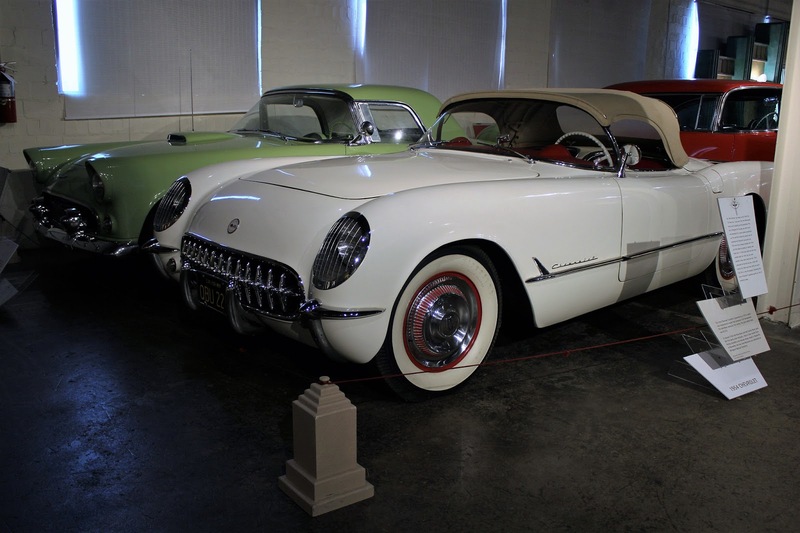 T-Birds are not built today while the Corvette soldiers on its seventh generation but one would not have guessed that at the time. In 1956, 15,632 Thunderbirds were sold, with steel bodies, roll-up windows, and V-8 engines, while the 1954 Corvette, the ostensible "sports car," offered more primitive accommodations, an anemic engine and marginal handling, along with so-so build quality, meaning that many of the 3,640 cars built did not even find buyers that year. 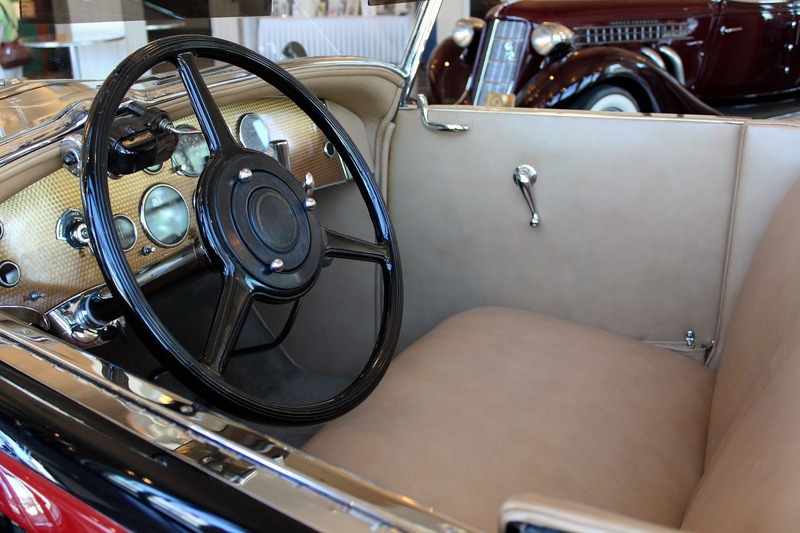 The Thunderbird turned into a porky four seat "personal luxury" car in 1958, then after production fits and starts over the years finally disappeared in 2005 after becoming a short-lived retro two-seater. The Corvette has become GM's halo car and one of the best high-performance cars on the market. The collector car world has spoken too: a typical 1954 Corvette is $80,000 today, while the Thunderbird goes for around $48,000.